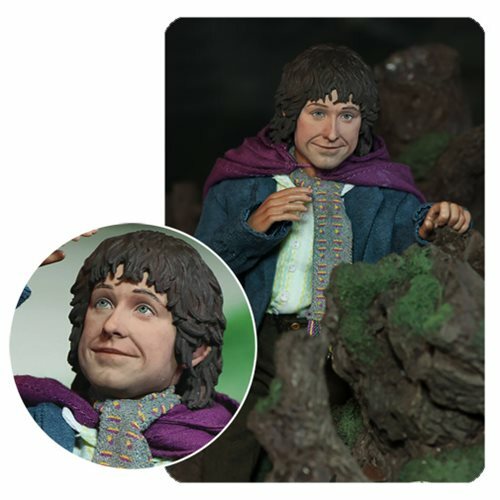 From Asmus Toys comes this Lord of the Rings Pippin Slim Series 1:6 Scale Action Figure. The authentic and detailed fully realistic likeness of Merry from The Lord of the Rings: Return of the King. The Lord of the Rings Pippin Slim Series 1:6 Scale Action Figure utilizes the Asmus Toys T3 male body. Pippin comes dressed in a white long sleeved shirt with printed pattern, brown trousers, special printed scarf, green coat, and purple cloak. Ages 15 and up.